Pennywise Burst-A-Box | Nerd Much? IT was my favorite horror movie of 2017. I was a huge fan of the Tim Curry TV-movie version of IT and I wasn’t really sold on the new Pennywise at first — at least until I saw the movie! I love the look and attitude of the new Pennywise and this “Burst-A-Box” by Mezco Toys also references a really fun form Pennywise takes during the movie. The packaging emphasizes the un-popped version of the jack-in-the-box and the tin box that he comes in. 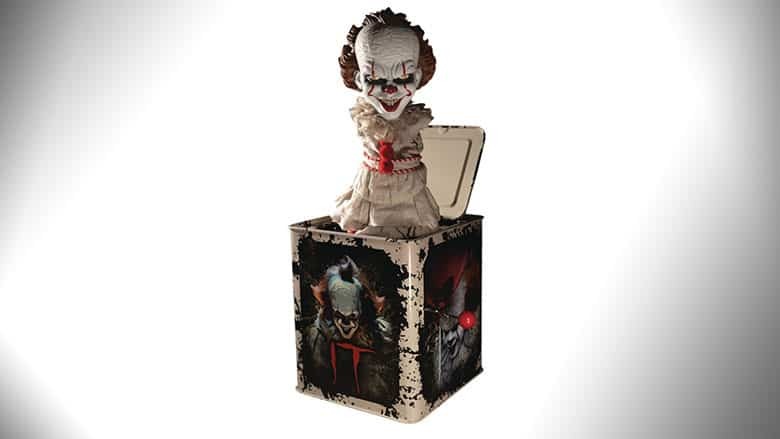 The box is nice and creepy and has Pennywise on four sides. It also looks old and faded as well which just makes it creepier. I also really like the handle has a red ball at the end because it reminds me of the balloons Pennywise uses. The Pennywise in the box is terrifying. The head is incredibly creepy and has all sorts of ridges and bumps which comes straight out of the movie. The expression is menacing and the smile on his face really emphasizes his teeth. What is also a really neat attention to detail is that the eyes aren’t looking the same direction. One of my favorite bits in the movie is that Pennywise’s eyes are always looking in different directions, it is a subtle thing to look out for. The Pennywise figure is wrapped in cloth that resembles the clown suit worn in the movie. The ruffles at the “collar” are a really nice touch as well. The best part is that they move when he pops out of the box. Yes, that’s right, I opened the package and played around with it for a bit. It worked really well and freaked me out every time. After trying it a few times and probably giving myself nightmares for a week, I left him on my shelf, out of the tin box. The whole package is about $60 dollars and totally worth it as a fan of IT. Definitely a great buy! It’s available on Amazon and at the official Warner Bros. Shop.